A single gram of healthy soil contains millions of organisms including earthworms, nematodes, mites, insects, fungi, bacteria and actinomycetes. 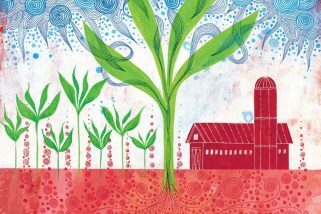 Soil is a frontier for exploration: Only about 1 percent of soil micro-organisms have been identified. Soil stores water: A one percent increase in organic matter in the top six inches of soil would hold approximately 27,000 gallons of additional water per acre. Soil stores vast quantities of carbon: Scientists say that more carbon resides in soil than in the atmosphere and all plant life combined; there are 2,500 billion tons of carbon in soil, compared with 800 billion tons in the atmosphere and 560 billion tons in plant and animal life. Soil mismanagement has contributed to climate change: The world’s soils have lost between 50-70% of their original carbon stock, much of which has been released into the atmosphere as carbon dioxide. Soil is in trouble: The Food and Agriculture Organization of the United Nations (FAO) estimated that 33% of soil is moderately to highly degraded through erosion, salinization, compaction, acidification, chemical pollution and nutrient depletion, hampering soils’ function and affecting food production. Soil that is not covered with vegetative matter is vulnerable: Soil is being swept and washed away 10 to 40 times faster than it is being replenished. We can rebuild carbon stocks in the soil: A considerable part of the depleted soil organic carbon (SOC) pool can be restored through conversion of marginal lands into restorative land uses, adoption of conservation tillage with cover crops and crop residue mulch, nutrient cycling including the use of compost and manure, and other systems of sustainable management of soil and water resources.